As she comes on stage, the stadium lights up, the plastic rubbery wristbands we’ve slipped onto our wrists suddenly alive and pulsating with colour, to the beat of a song I don’t recognize. There is a collective inhale, a gasp, as we prepare for this spectacle, and recognize its announcement, its arrival. She is wearing sunglasses and a jacket and very high heels. From where we are sitting, high up in the highest, remotest seats of this concrete bunker, she is dollhouse-sized, but her face, her stride, is simultaneously captured and broadcast onto two wide screens that flank the stage. I don’t know the first song: Welcome to New York. But she’s just getting warmed up. 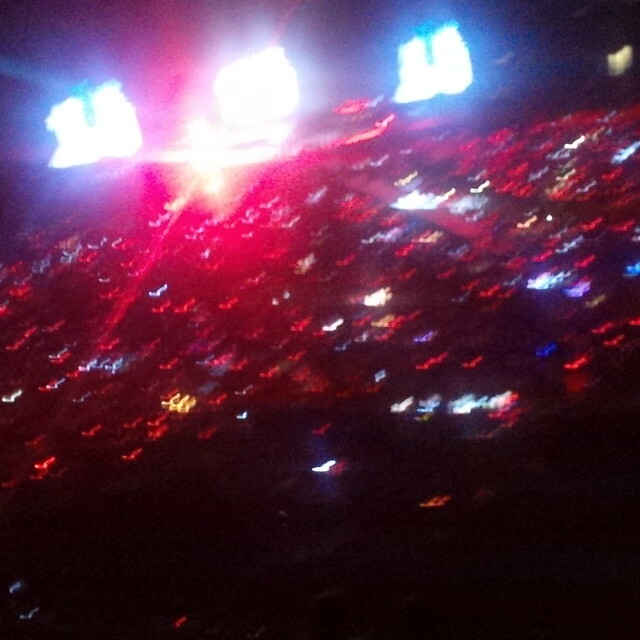 The third song is Style. She strides down the narrow runway, but doesn’t come quite far enough. It’s like she’s teasing the audience, walking forward and back, but never to the end of the platform that stretches out into the audience below, those who must have paid astronomical fees for their tickets. I want her come to the end of the runway. I wait for her to come all the way down, where we will be able to see her clearly. I think that she is deliberately teasing us, and I am impressed that desire can be invented so easily, so strategically, by the simple act of denial. The semaphores in this show are simple and effective, the narrative clean and crisply delineated. She takes off her sunglasses, she pulls off the jacket, as if now we will see her for who she is—a doll-like creation of red lips and pale perfect skin and arched brows. She is dressed in black, the outfit cutting across her pale skin, sectioning her up into pieces. I wonder how she can stride the stage in such a short skirt with such confidence. But is it confidence? 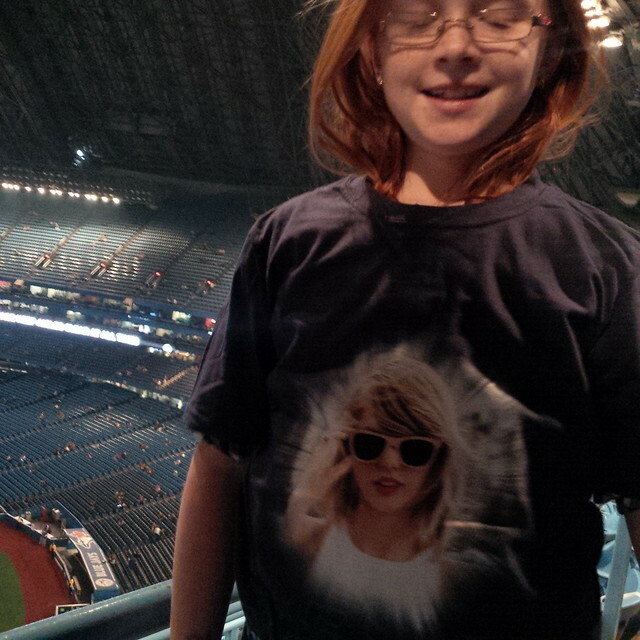 I think, but do not say to my daughter, that Taylor Swift is not singing. She is not even doing a particularly good job at lip synching. After having heard the first two performers, both young men, sing and play their guitars with flair and emotion and talent, this is disappointing. I admit to initial disappointment, as she whips off her sunglasses and disrobes before us, and holds the mic at an unlikely distance from her lips, her mouth moving out of synch with the words that are soaring through the air: We’ll never go out of style, we’ll never go out of style. But I will forgive her for this lapse later in the show. Because the singing is the least of what she is attempting: What she is attempting is the creation of spectacular flashing moments, a montage that tells a story—the story of Taylor—replete with fleeting images, shimmering, an illusion of perfection, an illusion of intimacy, as gutsy as it is implausible. Later in the evening, when she is spinning around in the air at the end of the runway, which has been tilted and raised high up on a mechanical arm, later, when she is being whirled counter-clockwise before us, grounded to the platform by thin wires, playing or fake-playing chords on an electric piano, balancing in her high heels, hair swinging and swooping over her forehead, chased by high-wire cameras, projected onto enormous screens, all while singing into a microphone, I will forgive her for singing over a recorded track, singing only partially. I will admire her willingness to be on display in this feat of daring, and to display for her audience only the most idealized version of her experience of this moment. Even when she struggles to move the microphone from her hand, where it has been strapped, into a microphone stand, she does not comment on the trouble she is having, she smiles and continues to talk to us about friendship, about how she has an easy way with friends, and can feel as close to someone she’s just met as to someone she’s known forever, if this someone (could we all imagine it is us?) is authentic and trustworthy. Finally, the microphone slides into the stand. She has not burdened us with this technical irritation. She doesn’t complain, she refuses to draw attention to it. The show churns onward, making its own pace. The plastic wristband warms my wrist oddly, in an electrical manner that disturbs me, but I do not take it off. When we arrived, we found that wristbands were taped to the back of every seat in the stadium. When we first slid the wristbands onto our arms, it seemed almost cultish, all of us willingly submitting to the mysterious plastic band, with no concern for what it might do to us. 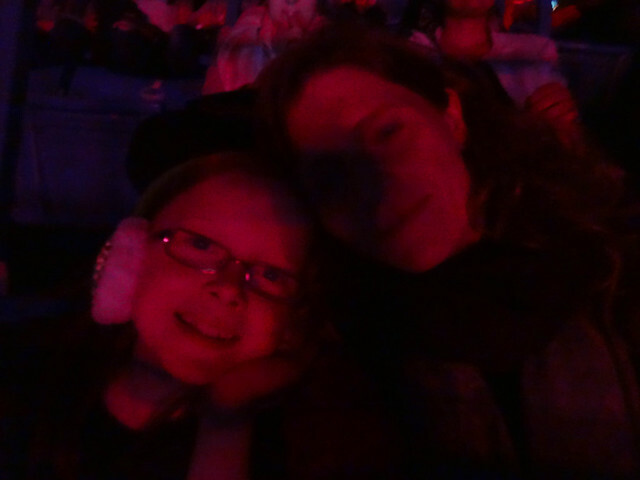 We trusted implicitly the glossy promises of Taylor Swift, her relentless optimism projected onto the screen before the show began, along with her stories about her cats, whose names my daughter knows. “Really, you know their names?” She shrugs. Sure. As if everyone does. When the wristbands light up and flash and fill the stadium with a pulsating glow, I willingly wave my arm in the air, as instructed, even though my skin gets hot underneath the plastic, and even though I have to wrap the plastic around my palm to keep it from sliding down under my coat sleeve. 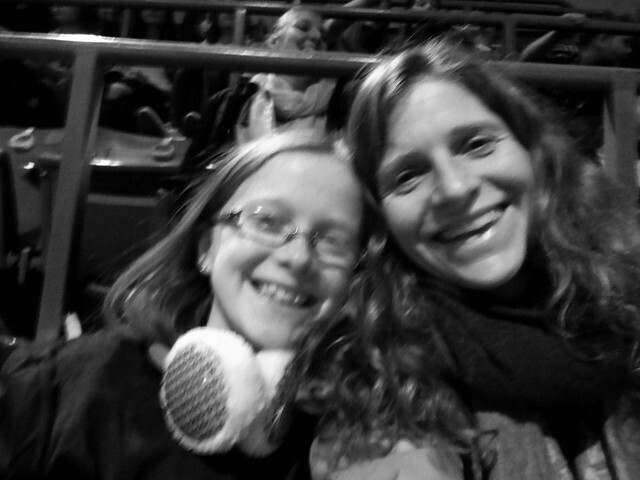 The woman next to me, who has also come with her pre-teen daughter, dances wildly in her seat, sings breathlessly, gasping and giggling, while her daughter sits rather rigidly; I catch the girl observing us when I glance in her direction. The woman stops herself sometimes, as if embarrassed, but is again overcome by emotion. She knows the words to every song. I know the words to three songs. My daughter knows the words to a few more, but not many. 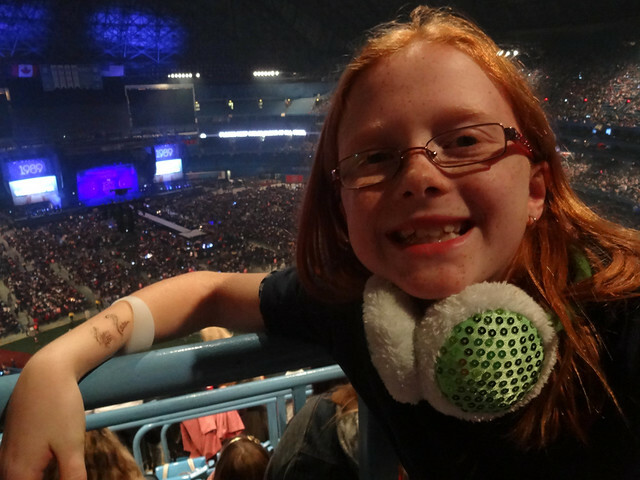 We are here because her dad and I thought it would be an exciting and surprising birthday gift; she had written in a school project last spring that this was one of her dreams, to go to a Taylor Swift concert. That’s something we could actually do! we thought, her dad and I. So. We are here for the show, for the novelty of it, and for Taylor Swift whom we both like, if only abstractly—we turn up the radio when her songs come on and sing along, but our admiration doesn’t go a great deal further. We are here together, witness to what the power of money and imagination can create on a vast stage, for the consumption of a broad audience. “Hi, I’m Taylor,” she says as she marches down the runway, early in the evening. She sounds nervous, swallowing her words, but even this might be an act. Because I have so recently been so exhausted after performances on a completely different scale, I wonder at her ability to pull out this magnitude of a performance, night after night. I wonder at her willingness to go on, city after city, show after show. But when she stands at evening’s end to receive the applause ricocheting off the closed stadium roof and the girls’ screaming, I think, how could this not be addictive? How could you not believe the stories being told about you? You are a blank slate for the projections of millions of people, and your words are being sung back to you in unison, and your very body, your very flesh and blood is a recipient of this adulation. You absorb the warmth from all these people, here for you, and you become in this moment as near to being one of the gods as a human can get. “I’m doing a dance to it in gym class,” my daughter said. I might have been missing the point. My daughter might not have been listening. That’s a bit different, message-wise, a bit richer. But I don’t like songs about good girls, because it’s us against them, good girls v bad girls, and who are the bad girls? What do they do that’s so bad? And what do the good girls do that’s so good, come to think of it? Who is telling them they are good or bad? I also don’t like models for girlhood who teeter in high heels, their exceptionally skinny bodies exposed and hairless. But I do like that this young woman is an extraordinarily powerful presence on the stage, and that she talks to her audience in a way that appears personal, promoting messages of trust, vulnerability, no shame, and strong female friendship. She probably has to help take down the stage. Why does this post have no title? This is exceptionally good writing. I enjoyed the variety of angles that you took as a concert spectator, a mother, a mild cynic (perhaps). Wow! Thank you, Ted. I wrote it for a writing assignment I gave my creative writing class — I like to write along with them to understand better what I’m asking them to do. I like the idea of Taylor helping to take down the stage with the roadies. We aren’t at the concert-going age yet but I imagine I will be in your position one of these days. It might even be with Taylor Swift (although I do agree that she will go out of style like everything else before her). My girls enjoy dancing around to the few songs that they have heard but I won’t let them watch all the videos – some of them are a little too mature for little eyes. I haven’t seen the videos, except for We Are Never Getting Back Together (which is a really fun video! ), and I’ll admit I was a little bit surprised by her on-stage attire: it was more sexualized than I’d expected. Cynical, perhaps, but beautifully relayed to those of us who have never been to one of Taylor’s shows and may never in the future. A lot to mull over, all the angles yes, that you cover. What’s with those arm bands anyway? Wow. It’s a circus. It’s all an act, but it’s not. She’s definitely one-of-a-kind, portrays herself as a good girl, most of the time, but then again I don’t get visual cues. I go by the image I feel with her. Thanks for sharing this interesting mother-daughter outing. I read this, an exercise you were doing, and I want to take writing classes like yours, if this is the kind of thing it might involve. Not sure what the exercise would have been, but you got an A.
I would have to say my favourite is Blank Space. Did she do that one?